When is the last time you needed a little grace? I don’t know about you, but I need it everyday. 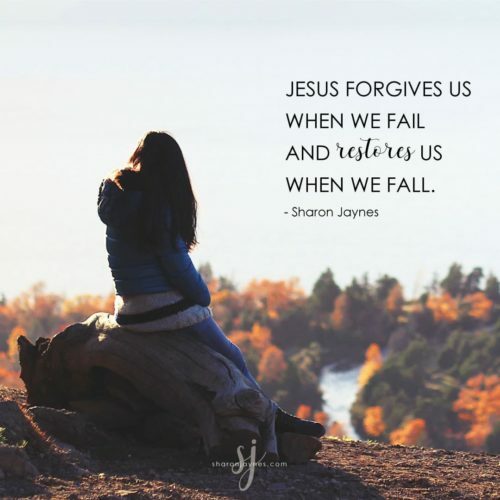 I’m writing about grace over at Proverbs 31 Ministries today, and I wanted to share with you too. It was a tough six hours as Anna waited for her 44-inch, 49-pound lump of love daughter to get off the school bus. This was not a good day. “What’s this about?” Anna asked, pointing to L-i-l-l-i-a-n carved into the wood. Lillian’s rosy lower lip quivered, her green eyes filled with tears, and her face turned autumn red. “I’m sorry,” she whimpered with bowed head. “What were you thinking?” Anna asked sternly. Anna is my niece. As she told me this story, I saw myself in young Lillian. I wonder if you did, too. What’s the answer? Don’t wait around and fiddle with it! Walk away. Right away. Paul wrote: “The temptations in your life are no different from what others experience. And God is faithful. He will not allow the temptation to be more than you can stand. When you are tempted, he will show you a way out so that you can endure” (1 Corinthians 10:13). That’s true whether the temptation is flirting with that married man at the office, having one too many glasses of wine, searching for an old boyfriend on Facebook, sharing a juicy morsel of gossip with a friend, or carving your name in your mom’s dresser with a nail. I love that Lillian said, “I’ll never listen to the devil again.” Oh, don’t you wish that were true? For Lillian. For me. For you. But we will. That’s when I thank Jesus for the nails — not one, but three — that pierced His hands and feet so we can be forgiven. It’s called G-R-A-C-E … and we all need it. Dear Lord, when I encounter temptation today, help me walk away right away. Give me the wisdom not to fiddle with it, the strength not to give in to it, and the courage to turn my back on it. Thank You for always providing a way out. In Jesus’ Name, Amen. Now back to my original question. When is the last time someone extended grace to you? Leave a comment and let’s celebrate! Sometimes we forget about God’s grace. That’s when we start listening to the lies that tell us that we’re a failure who’s not good enough. It’s time to silence the lies that steal our confidence and start replacing those lies with truth! 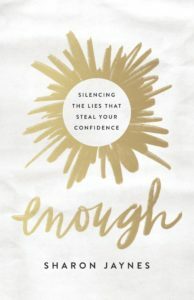 Join Sharon in her book, Enough: Silencing the Lies that Steal Your Confidence and learn how to replace the lies with truth. Because of Jesus in you, you are more than enough! Congratulations to the winners from the random drawing for a FREE copy of TAKE HOLD OF THE FAITH YOU LONG FOR from the comments of the last post! Evelyn Torres, Nelda Rivas, Karen Pope, Paige, and Jan. Be on the lookout for a notification email! Can’t remember any time grace was extended to me by anyone but when l remember the grace of God, that’s sufficient for me. And l appreciate the grace of God over me. Alleluia. Thank you. I need Grace everyday. The thought in my head is not always God. I was just saying this to my ladies last night. God provides a way out…look for it! I love this, reading it made me think of how much GRACE my heavenly father gives me daily. I am blessed to have a personal savior named Jesus!!! I just bought your book Enough. I’m 65 and have struggling with who I am. My husband of 38 years has made me feel like I was never good enough. We are separated now and I’m working on being good enough. I thank God for His grace. As ‘good’ as we think we are, we fall short . . we all fall short. If not for God’s grace, we would be soo overwhelmed with guilt that we could never overcome satan’s temptations & name calling. We would be a useless heap in a corner somewhere instead of His light upon the hill!! I am so thankful for God’s grace. Now to learn to extend that grace from God to myself. Learning to forgive myself when I mess up is so difficult; rehashing why I do something I didn’t want to do but I do it anyway. I just keep focusing on God Who is in control and loves me no matter what! I am so grateful for God’s grace that is offered to me daily. I am so grateful for grace from my spouse, my children, my family, my work family and from strangers. We are Can I just say how much I hate Satan. His every attempt to invade our thoughts, provoke us with temptation and his desire to devour us. Praise God for the blood shed on the cross by His One and Only Son. Thank you for your continued work in furthering the Kingdom of God. The Holy Spirit spoke to me in this message. I recently completed a daily devotional called “One Word”. The whole idea behind it is to listen to God and ask for one word to study and live through the year. No resolution, just one word from God. My word is Grace. Since that day, I have heard that word when I get angry with someone. I hear that word when I want to think a certain way about someone. Grace. We all need it. We all need to give it. I love this message! It is so spot- on. Thank you for this. My husband of 28 years walked out on me this past Aug. I am disable from RA, lupus, fibromyalgia, etc. He was my caregiver too. We have started the procedures, and he is blaming me for using an attorney. He just wants me to agree to what he says. Today he wrote me a very ugly and distasteful email. I so much wanted to respond with a vengeance, but I withheld. About an hour later, a lady that is in my Life Group at church called me. This lady is new to our church and I had never met her before last week. She tracked my number and called because God was telling her to call me and tell me that I have his grace in dealing with this divorce. She said it had been on her heart for a week, and today the urge was even stronger. I was in shock. God has this and it is all in his timing. He is giving me grace to calm me and help me not to respond at all no matter how much my husband is hurting me. I am a baby in my walk with the Lord, and I asked my mother what grace really meant. Then I read this tonight. God is totally in control. I know this is his will for my life. My husband is not good for me, and God is saving me. Thank you again, this was the perfect example of GRACE.